eat, drink & be vegan: New Website Plans and New Facebook Page! New Website Plans and New Facebook Page! I'm doing some vegan housekeeping. 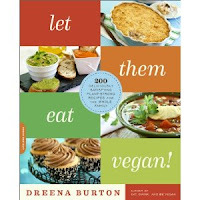 Or rather, some planning and restructuring for the launch of Let Them Eat Vegan. It will be on shelves in just over a month, but you can preorder now! I have also created a new facebook page. Please link through and "like" to stay up to date with my posts and news, as I will be phasing out my current friend page and networking through this new page. AND, I will be doing a "countdown" to the launch of LTEV, complete with giveaways and contests. But, be sure to connect with my new facebook page to receive updates. Finally, a reminder to cast your vote my way in the Circle of Moms contest. You do not need to register to vote - just a simple click, takes a second or two. You can vote every day until Feb. 14th... thanks for your support! Dreena, I cannot tell you how thrilled I am to see that you have a new book coming out! I'm definitely doing a post on it on my blog. I've come back to your recipes again and again, especially now that I've cut out wheat, I love how in Vive Vegan book has a ton of wheat free options. I aspire to be as cool as you someday! Thanks for all the love you bring to the kitchen! Congratulations - March 6, That is so close. I know by the time it arrives in Australia here, it's gonna be April.. How devastating! Congrats on your good work! Very excited to see some of Hannah Kaminsky's wonderful photos of your food, too.